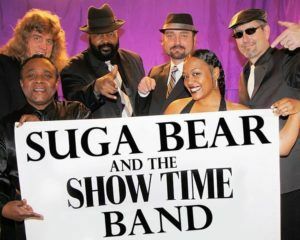 Suga Bear & The Show Tine Band is one of the hottest high energy live bands based out of Colorado Springs, Co. The seven member group is composed of a diverse group of musicians that helps define fun and excitement. The group is composed of the vocal Duo of, Suga’ Bear, Lady Shay, Aundre (drums), Scott Haffley (bass), Dan Buckley (guitar), Joe Kaiser (keyboards) back ground vocals and Jeff to the left (Horns) back ground vocals. The bands distictive style and raw energy will keep you dancing, shaking and moving from start to finish. Show Time Band is always exciting on stage with their unmistakable sound and electrifying showmanship, combining all the great sounds of R&B, Funk, Motown, and top 40 hits to create their own flow of “Hot dance music”.